Lévy flights are a class of random walksdirectly inspired by observing animal foraging habits, where a power-law distribution of the stride length can be often observed. This implies that, while the vast majority of the strides will be short, on rare occasions, the strides are gigantic. We propose a mutation mechanism in Linear Genetic Programming inspired by this ethological behavior, thus obtaining a self-adaptive mutation rate. We experimentally test this original approach on three different classes of problems: Boolean regression, quadratic polynomial regression, and surface reconstruction. We find that in all cases, our method outperforms the generic, commonly used constant mutation rate of one over the size of the genotype. Moreover, we compare different common values of the power-law exponent to the another self-adaptive mutation mechanism directly inspired by Simulated Annealing. 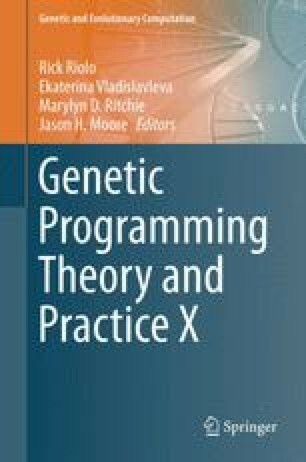 We conclude that our novel method is a viable alternative to constant and self-adaptive mutation rates, especially because it tends to reduce the number of parameters of genetic programming. This work was partially supported by NIH grants LM-009012, LM010098, AI59694, and by the Swiss National Science Foundation grant PBLAP3-136923. The authors are grateful to Luca Ferreri for his precious help with statistical calculations and the corresponding figures, and to Joshua L. Payne for his invaluable contribution to the discussions.